When two friends separately mentioned to me a book they read about decluttering their lives starting with their sock drawers, I knew the Universe was trying to tell me something. My sock drawer is crammed so tightly that it refuses to close unless I jam it shut with my full body weight. It’s a disaster. Oh no! Does that mean my life is a disaster, too? I wondered. I know what you’re thinking: That Jess must really love her socks to have an entire drawer dedicated to them! I don’t, really. No sock fetish here. I tend to wear the same socks over and over. So, what the heck is in my sock drawer? What is jamming up my furniture and my life? HOW will I EVER declutter the mess of EVERYTHING? I wasn’t convinced it was possible, but on the advice of Shaunna and Angela and their excellent book (I’m hoping one of them comments below to name the book and give credit where credit is due), I thought I’d give it a shot. They directed me to take everything out of the drawer. Look at each item. Cherry pick my favorite socks and roll them up, then place them lovingly back in the drawer. The remaining socks – the ones still out free in the world – were either garbage and needed to be thrown out, or “maybes” which needed to earn their way back into the drawer. The end result should look like a drawer with one layer of rolled up socks, where I’d be able to see every pair, love every pair, live every pair. 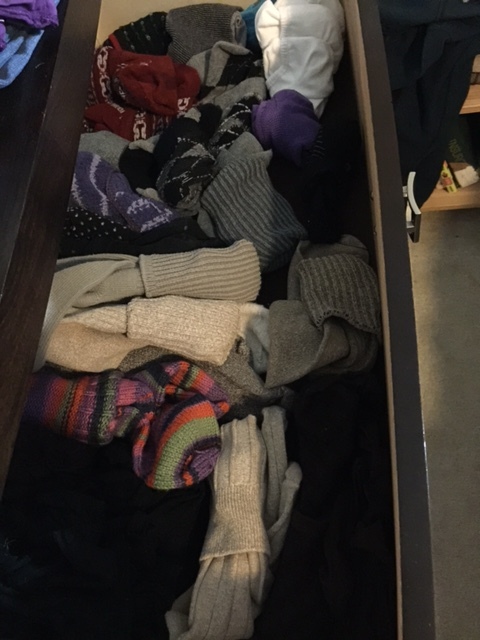 The Original Sock Drawer: A Metaphor for My Life? It’s messy. You can’t tell from the picture, but that pile of socks goes about six inches deep. I can’t see anything except the lucky few socks that wiggled their way to the top. That green pair? That was a parting gift from a medical procedure I had last year. I thought I needed to keep them since they have those rubber gripper things on the bottom. That pink pom-pom you see? That’s attached to a giant grey knit sock with a flannel layer inside capable of heating your feet to astronomical temperatures. That big white blur is a gaggle of ankle socks I recently picked up while waiting in line at Old Navy (they are the current faves – shh, don’t tell the others). Oh my! Help me, Sock Gods! Despite my initial shock at seeing the suckers laid out like that waiting for some sort of action from me, I did manage to dig out some interesting artifacts. 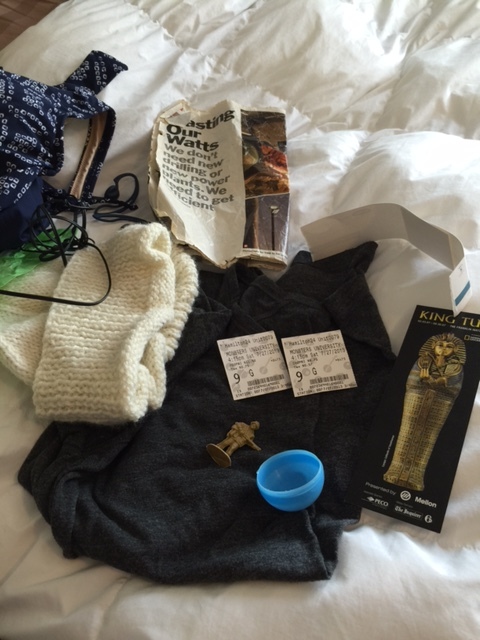 Behold, the non-sock items found in the sock drawer! Magazine article that JC carried around when he was a baby (he was interested in lighting systems), a hat (knit by Mom or Angela, apologies but I can’t recall), a green dog poop bag (unused, thankfully), two ticket stubs from Monsters University circa 2013, half of a plastic Easter egg, an army man, a King Tut bookmark, a bathing suit, and a pair of earbuds. I played with the non-sock items for awhile, then looked back to the pile of socks and started to sweat. The pile seemed to grow before my eyes, taking on a life of its own. I don’t know, I thought. Maybe I don’t want to choose between my socks. Maybe I like my drawer (and life) cluttered. My head began to throb. The pressure was too much. AHHH, stupid socks! This must be why cavemen went barefoot! Every instinct screamed at me to scoop the socks up, shove them all back into the drawer, and go binge watch House of Cards. After all, those green medical gripper socks could come in handy with hardwood floors. The new socks from Old Navy were bright enough to see through the masses. And the pink pom-pom heated socks? It got really cold this winter, friends. With global warming, you never know with this crazy weather when you may need really, super warm socks. Not to mention, I’d never find matches – my dryer eats socks. This is a lost cause, I thought. HOW WOULD I EVER DECLUTTER MY LIFE/SOCKS? When we came back, I ignored the socks for a few more hours, then decided it was time. Time to do something with the lost little buggers. Time to find their matches. Time to part with the old timers and celebrate the newbies. Time to declutter my sock drawer and my life. TIme to put on my Big Girl Socks and tackle the pile (also, bedtime was quickly approaching). 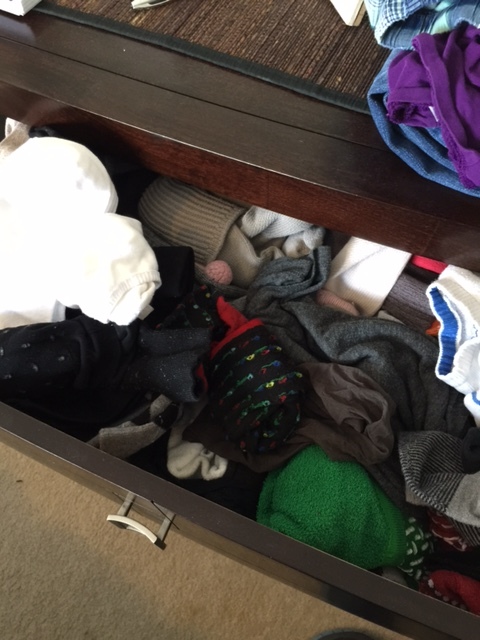 Decluttered sock drawer, decluttered life! It doesn’t look like much in the picture and my rolling technique leaves a lot to be desired, but I assure you, there is only one layer and now I see every pair. I’m already breathing easier knowing that each sock coupling has earned a well-deserved place in my drawer. (Just in case you’re wondering, the green medical procedure pair had to be sacrificed for the greater good). Being unemployed certainly has its advantages. No way would I have tackled that sock drawer in the middle of a work week! I know you’re all jealous of my day, reading this and itching to get to your own sock drawers. The excitement of my life is overflowing into yours, so you’re welcome. I’ve said it before and I’ll say it again – the fun never ends here at WOAW. If you’re still awake after reading this, thank you. 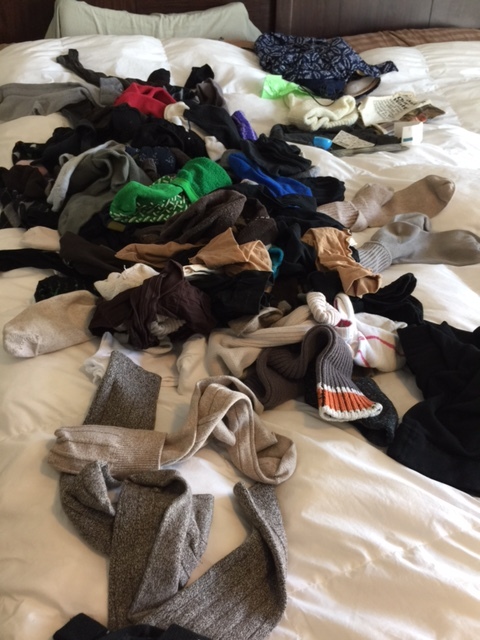 From me, my sock drawer, and my new, decluttered life! Sorry, I’ll get my coat. A friend of ours’ 5 year-old loved the Kings of Leon song and she told her daughter that it was ‘My socks are on fire’ – makes much more sense really! I love it! So cute. I want to give a shout out to my parents. Thanks for setting me up with your house! Also, thanks to the collections of old cards you kept from 1972 and your medical procedure from 1982. The drawing I made in the 2nd grade. All of this and much, much more…shoved into countless drawers. So my life has been decluttering for ages now since their passing. Every item has to be examined and every noteworthy item has to be seen by my nostalgic sibling who lives an hour and a half away (thus not seeing these items often). One day I will have one of those simple, clean homes seen in some magazine. We all need a dream! 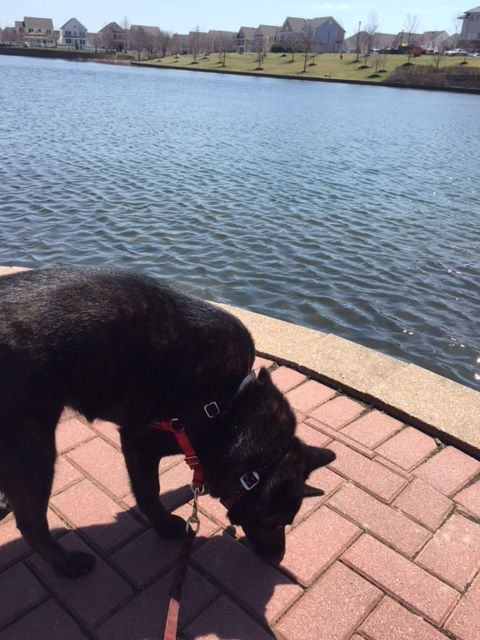 You should do yours and then blog about your experience! Hi, the book I was talking about is The Life Changing Magic of Tidying Up: The Japanese Art of Decluttering and Organizing. It really was life changing! Thanks for starting my day with a laugh. Now do you want to come do mine?!! Angela- That’s the book I read, too! I have to admit that I have successfully de cluttered my kids’ drawers and my husband’s, but I’m apparently still too emotionally cluttered to find much success yet with my own. I had no idea – the author is spot on with much that she teaches. She would also want you to let your socks ‘rest’ – so, when you fold them together don’t stretch one around the other. Lay them out next to each other and roll them together without stretching them. Think sock cinnamon roll. For Marisa’s drawer, I used a few narrow shoe boxes to keep them from unrolling.